Selenium Tetrabromide is a chemical compound with a molecular formula of (Br4)Se or SeBr4. It has a molecular weight of 398.587 grams/mole. 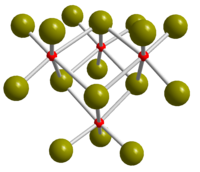 It has is a chemically neutral charge with a 2D see-saw structure. The particles in the molecule are held together by covalent bonds. It is similar to selenium tetrafluoride and selenium tetrachloride in it's properties. The lewis diagram is above this paragraph. It was established before 1969 that Selenium Tetrabromide existed in a solid state. It appears as a powder and decomposes in water. The melting point is between 70-80 degrees Celsius. It is usually marked as a "dangerous" substance to come in contact with. How is Selenium Tetrabromide formed? The crystal structure for this substance is below this paragraph. Thank you for reading this article!